"You should understand that, in this country, perjury is a hanging offense." 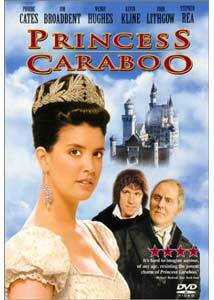 Princess Caraboo stars Phoebe Cates as a mysterious young woman who turns up in the English countryside, apparently unable to speak or comprehend the English language. Taken in by the upwardly mobile Mr. and Mrs. Worrall (Jim Broadbent and Mary Hughes), the princess finds herself moving in ever higher social circles, eventually meeting the Prince Regent (John Sessions). Meanwhile, journalist J.M. Gutch (Stephen Rea), linguist Professor Wilkinson (John Lithgow) and the Worralls' manservant Frixos (Kevin Kline) suspect the Princess is not as she appears. The movie is based on one of the most famous hoaxes of the early nineteenth century, though a number of details and names are changed in order to provide a coherent narrative and a romantic element absent from the truth of the matter. Unfortunately, this approach obscures the heart of the story—we never really get to know the socially unfortunate woman who tried to pass herself off as a princess, nor any of the people who believed in her fantasy. The plot points seem inorganic and mechanical, turning what should be a fascinating tale about human nature into a dry pseudo-fairy tale, lacking in emotional substance or color. Cates is constrained by her character's charade, Rea is so earnest as to seem cold and distant, and Kline is surprisingly stiff and unfunny behind his thick accent. Wendy Hughes makes a fine impression early on, but the script affords her little opportunity to build a memorable performance. Production values are solid across the board, with well-designed period sets and some gorgeous costumes, photography by the great Freddie Francis, and orchestral music by Richard Hartley. (Hartley collaborated with Richard O'Brien on Shock Treatment, and Rocky Horror fans will appreciate a singing cameo by "Little" Nell Campbell.) But Princess Caraboo never quite clicks into place; it's a sumptuous-looking but empty-headed production, a near-miss that disappoints primarily because it might have been so much better. Image Transfer Review: Columbia TriStar presents Princess Caraboo in cropped full-frame 1.33:1 format. The opening credits are slightly letterboxed, but five seconds after the film switches into full-frame mode, a speaking character is mercilessly cropped off the left side of the screen, and such irritations turn up every few minutes thereafter. The source print is in middling condition, with quite a bit of dirt and damage in spots, and the single-layer transfer generally looks soft and occasionally muddy. But the heavy-handed pan-and-scan presentation is the primary villain here, omitting significant portions of the cinematography created by the great Freddie Francis. Audio Transfer Review: Princess Caraboo retains its original theatrical Dolby 2.0 Surround audio mix, with French and Spanish 2.0 monophonic tracks as well. It's a simple mix, generally centered with some surround ambience and bass activity to fill out the soundstage a bit. The French track is ambience-matched to the original English audio, but the Spanish audio sounds terrible, casually overdubbed with no attempt to match the sonic character of the original soundtrack. Not an impressive soundtrack, but not a bad transfer. The film's original trailer is presented in 1.33:1, Dolby 2.0 monophonic format, along with trailers for Ang Lee's Sense and Sensibility (1.85:1 letterboxed, Dolby 2.0 mono), Fly Away Home (1.33:1, Dolby 2.0 Surround, drawn from a poor-quality video master), and Running Free (1.33:1, Dolby Digital 5.1 audio). These seem to be aimed at a family audience, which may explain the pan-and-scan transfer on the feature proper. Terse biographical notes and selected filmographies, profiling director Michael Austin and the six lead performers. Princess Caraboo is a well-meaning but superficial account of one of the great hoaxes of the early 1800's. Columbia TriStar's DVD is badly marred by a cropped pan-and-scan transfer, making this disc impossible to recommend.